Fife Flyers three-game winning streak came to a disappointing end with a 5-2 defeat at Murrayfield Ice Arena. While Edinburgh Capitals were a much improved side from their 9-3 thrashing in Kirkcaldy on January 11, Flyers played a part in their own downfall by failing to live up to the standards set in weeks. Flyers were out of sorts - particularly in defence where costly mistakes were made - while the forwards had no answer to on-form Caps netminder Tomas Hiadlovksy. While bemoaning the fact that his side came up against a hot goalie, Flyers head coach Todd Dutiaume also admitted that there were problems with the performance. “Their goalie played exceptional, but we had a mixed bag tonight,” Dutiaume said. “The Chaumont, Fleming and Fulton line played some great hockey and Bobby had one of his best games, but a few guys just weren’t at the races. “We made some mental errors and a few defencemen just weren’t solid enough. “As soon as we have guys not giving us their best performance, we get thin quickly. “I warned our guys about this Edinburgh team - they are in a play-off bubble and desperate for points. Caps took the lead after 7.50 when Flyers played themselves into trouble in their own zone - Matt Nickerson passing the puck straight to Jade Portwood behind the net - who set-up Denis Rix, all alone in front, to slot home. Flyers put some pressure on the Caps net, but with Hiadlovsky making several sprawling saves, it took the visitors until the 31st minute to draw level. Chaumont was the beneficiary of some statuesque Caps defending as he skated in from the wing with purpose, and as Caps stood and watched, he drew Hiadlovksy before sweeping the puck into the net for a sweet solo goal. At this stage Flyers were having slightly more of the play, but five minutes later Caps regained the lead as a breakdown in Flyers defence saw Rene Jarolin left unattended at the back post, and he rounded Regan to slot home. Caps put daylight between the sides four minutes into period three as they hit Flyers on the counter-attack, Jarolin bamboozling the diving Nico Suoraniemi with a dummy before firing in for 3-1. It was 4-1 and effectively game over on 50.50 as Jarolin pounced on his own rebound to beat an exasperated Regan, who rightly expected his defence to help out after he had stonewalled the first attempt. Ned Lukacevic gave Flyers false hope on 57.58, tipping home Kyle Haines’ rising slapshot, and Regan was withdrawn for an extra skater as the Fifers went for broke. But after failing to set up an attacking play with the extra skater, Flyers lost the puck and left Jarolin to skate down the pad unopposed to grab an empty net fifth, and seal his hat-trick. 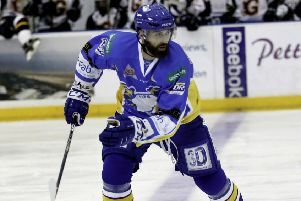 This was only Caps second win over Flyers in nine attempts this season, and Dutiaume stressed that his players must shrug off the disappointment and get back to winning ways away to Dundee Stars tomorrow (Sunday).